The ecoREHAB initiative was established in 2009. Working collaboratively with Ball State University, the City of Muncie’s Department of Community Development and the local non-profit agency ecoREHAB of Muncie, Inc. this outreach program’s aim is to provide leadership in the ecologically sound, green and sustainable rehabilitation of existing and abandoned housing. This initiative benefits not only Ball State students, but the communities of Muncie in taking steps to achieving the National Goals towards Sustainable Development in the areas of environmental protection, economic prosperity and social equity. Communities need resources to aid homeowners, neighborhood groups, and developers and a strategy for re-investment in the existing housing stock and older neighborhoods. These older neighborhoods are some of the city’s greatest assets, but are presently devalued and under-utilized. Affordability has often looked only at rents or first cost but ignore the ongoing costs of maintenance, utilities, and the long term impact on neighborhoods. The perception that costs traditionally associated with rehabbing older homes are higher than new construction leads to a desire for new housing. Yet, “the greenest building is the one that is already built,” and research shows that existing buildings have the potential to be far more energy efficient than commonly assumed. The green movement is creating an ever expanding toolbox of products, materials, and strategies that can be used to address these concerns. Offering training outreach programs to communities, community development corporations and individuals on methods of integrating similar programs and lessons learned by ecoREHAB. Similar to why the Neighborhood Repair Group initiative is important, this initiative will help stabilize the neighborhood housing market. The study area has 74 vacant residential structures or parcels. Vacant properties drain the city’s tax base, reducing funds available to repair much needed infrastructure. Additionally residents’ homes loose value and a bad perception is placed on the neighborhood. By using ecoREHAB on these properties the homes will be energy efficient, while serving as a model on how neighbors could improve efficiency. The neighborhood association should identify vacant, quality homes worth saving. The association should be strategic in their selection, choosing homes that could help solidify a block or section of a neighborhood while also considering a home which may be seen frequently to so investment and serve as a model. These homes could be prioritized from most wanted rehab to least, while also stating why they wish to see this particular home rehabbed. The neighborhood association could use the map in the following section as a starting location. Once the list is complete you should contact Mr. Johnathan Spodek of the ecorehab studio and Chris Allen of Muncie Redevelopment Commission, and explain why they should consider rehabbing a home in your neighborhood and provide him with the list of potential properties. This information could be leveraged if partnerships could be formed to support the initiative. Potential partners could be Habitat for Humanity, Ball Brothers Foundation, The Community Foundation of Muncie and Delaware County, and Muncie Community Development. The map below shows residential zoned properties. Single family homes are colored yellow, duplexes are colored orange, larger multifamily homes are colored brown, and vacant residential structures and/or parcels are colored red. Of the 697 residential parcels, 74 are vacant (as seen in red). These properties represent potential EcoREHAB parcels. Those which are surrounded by well-maintained housing stock should be given higher priority, as better housing stock typically represents more stable areas. 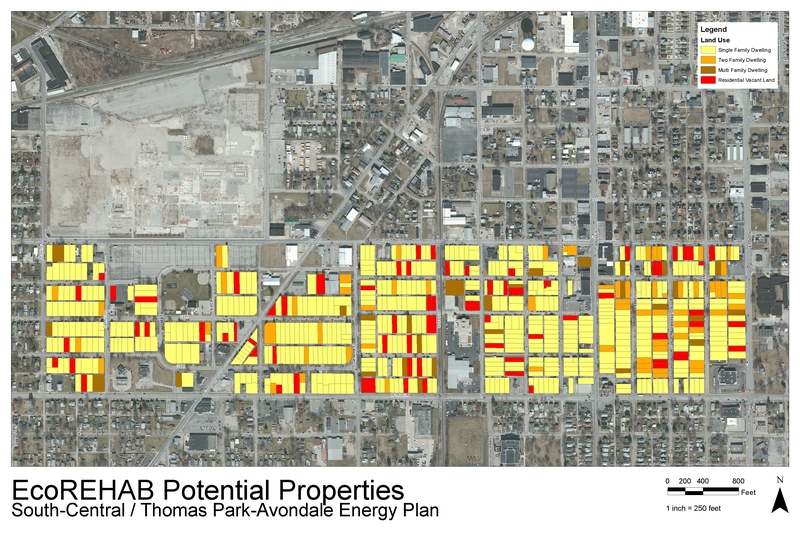 Figure 3 – EcoREHAB Map, identifying potential rehabs based on vacant residential properties. Map: Derek Walker. Case Study: 522 S Gharkey St. Muncie, IN. This home was completed in Muncie’s Old West End in 2012 and provides an example for similar projects. EcoREHAB studio is a symbiotic partnership between Ball State University and the housing not-for-profit ecoREHAB of Muncie, Inc. Ball State provides the leadership, organizational assistance, and immersive learning experiences for students. EcoREHAB of Muncie provides the management structure for the construction projects. Jointly, they develop and provide programming and community assistance. 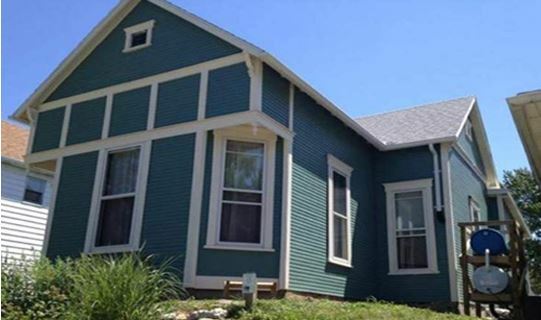 The goal is to provide leadership in ecologically sound, green and sustainable rehabilitation of existing homes while improving Muncie’s Quality of Place. Following city standards for low-moderate income housing, this house in Muncie’s Old West End neighborhood was evaluated, designed, spec’d, and rehabilitated by students from Ball State’s College of Architecture and Planning. The project incorporates green & sustainable building practices demonstrating that existing housing can be rehabbed to provide quality energy efficient housing in a manner that is economically competitive with traditional quality rehab methods. Emphasis is on strategies available to homeowners of all economic means rather than on pricey equipment and high-end materials. Detailed information on the studio and their accomplishments. Explains the process of reporting abandoned residential properties to the redevelopment commission.